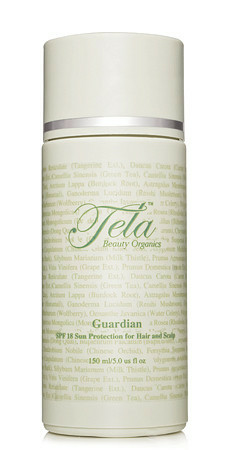 Guardian will keep your hair, skin and scalp protected from harmful UV rays. This unique and one of a kind multipurpose styling elixir combines SPF 18 with micro molecular herbs and plant proteins to sooth and protect skin and scalp from sun exposure and thermal styling. Guardian combats humidity, eliminates frizzy hair, controls static electricity, restores moisture and delivers an instant natural sheen finish. Organic antioxidants Carrot and Forsythia protect hair and scalp against free radical damage. A must have for color treated hair, and those who have exposed scalp areas. Up to 80 percent of the visible changes commonly attributed to damage and color fade are caused by the sun – Guardian is acclaimed as the first grooming product ever to combine multipurpose style benefits with an added SPF protection feature. Keeps color investments from thwarting quickly. Recommended for refining unique and frizzy hair textures. Improves the appearance of all hair fabrics. Superior detangling and smoothing benefits. Imparts shine and enhances natural color tones in the hair. Ideal multitask groom product for the whole family. Completely weightless, greaseless and water-soluble. To protect your color investment and enhance your style, apply a small amount of Guardian into the palm of hands. Rub palms together. Apply to damp or dry hair. Reapply as needed throughout the day. For added sun protection: Apply several times a day when in the sun concentrating on the scalp.